This method is described in the international standard ISO 1182 (E), and in NORDTEST method NT FIRE 001. The testing is performed in an open, vertically positioned cylindrical furnace. The furnace is preheated to 750 °C before the test specimen is introduced. The specimens are cylindrical with diameter 45 mm and height 50 mm. During the test temperatures in the furnace, on the specimen surface and in the specimen centre are measured. The duration of sustained flaming is also observed. The specimens are weighed before and after the test, and the weight loss is registered. 5 parallell tests are performed. Temperatures in the furnace and in the specimen before, during and at the end of the test. The criteria for non-combustibility are given below. The test specimens shall be cylindrical with diameter 45 +0-2 mm and height 50 ± 3 mm. If the material thicness is less than 50 mm, the specimens can be made by using a sufficient number of layers of the material. A complete test requires that at least 8 specimens are available. The specimens shall be representative of the material to be tested. Testing can be started when order is confirmed in writing, and the test specimens have been conditioned according to the standard. Normally it will last 3-4 weeks from we have received the test specimens until the test report is finished. The criteria below apply for the averaged test results from the five parallel tests. A product is assessed as non-combustible if the following criteria are satisfied. 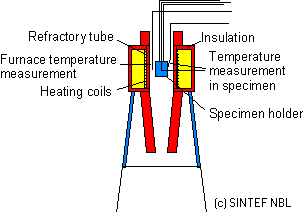 The average furnace tempearture should not exceed 50 °C. The mean duration of sustained flaming should not exceed 20 seconds. The average mass loss should not exceed 50% of the average original mass after cooling. The average furnace thermocouple temperature rise as calculated in 8.1.2 of ISO 1182 does not exceed 30 °C. The average surface thermocouple temperature rise as calculated in 8.1.2 of ISO 1182 does not exceed 30 °C. The mean duration of sustained flaming as calculated in 8.2.2 of ISO 1182 does not exceed 10 seconds. The average mass loss as calculated in 8.3 of ISO 1182 does not exceed 50 %.